Papers of George T. Underhill, Jr.: box 5, consisting of personal, family, business, and genealogical papers, correspondence, photographs, and artifacts, ca. 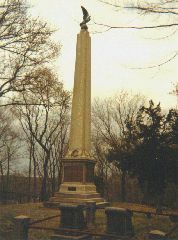 1957 to 2005 (donated in 2006 by George T. Underhill, Jr.
Myron C. Taylor (1874-1959), descended from Captain John Underhill through his mother, Mary Morgan Underhill, was a prominent New York attorney, banker, and businessman. 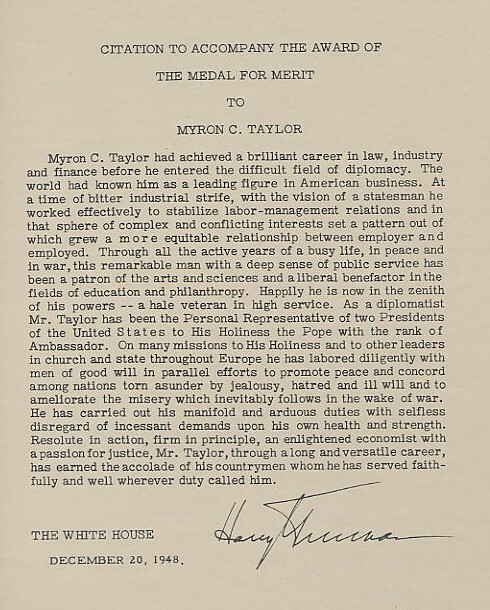 As head of the Finance Committee of the board of directors of U.S. Steel, and subsequently as Chairman and Chief Executive Officer from 1932 to 1938, Taylor modernized the corporation and enabled it to survive the rigors of the Depression. In 1937 he revolutionized labor relations in the steel industry when he negotiated an agreement with John L. Lewis, who had begun a drive to unionize steelworkers. 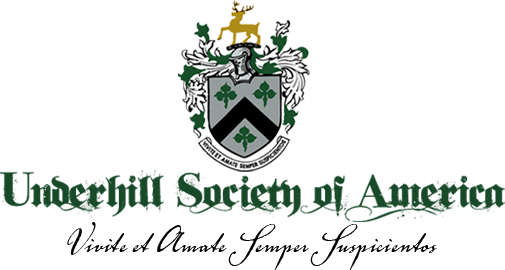 The following year Taylor left his post as Chairman (though he continued to serve on the Finance Committee of the board) to devote himself more fully to the relief and humanitarian activities he had begun earlier in the decade. During the Thirties, Taylor became a supporter of the New Deal and President Franklin D. Roosevelt, who in 1939 appointed this Episcopalian as his personal representative to Pope Pius XII with the rank of Ambassador, a post he continued to hold under President Harry S. Truman until 1949. A generous benefactor of the Underhill Society, in the late 1920s and early 1930s Taylor financed research on the life of Captain John Underhill and on the origins of the Underhill family in Warwickshire, sub-vended the publication of the first four volumes of The Underhill Genealogy, and played a central role in the Society’s affairs from that time until his death. 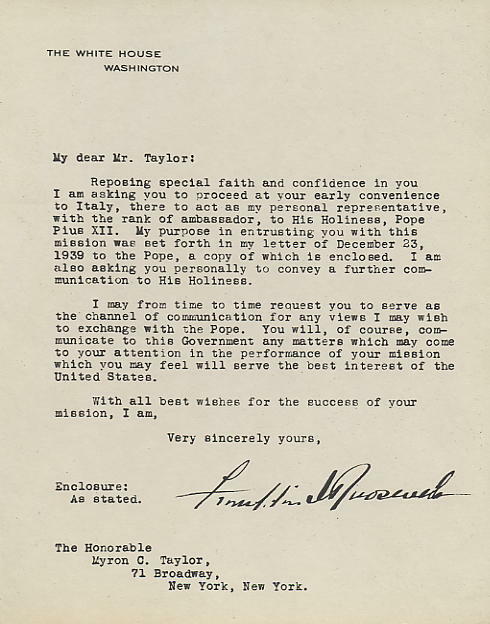 Instructions of President Franklin D. Roosevelt to Myron C. Taylor as his personal representative to Pope Pius XII; undated but probably issued ca. 23 December 1939, when Taylor accepted the appointment. Reproduction in Myron C. Taylor Scrapbook No. 2, Myron C. Taylor Papers, Underhill Society of America. The certificate accompanying the award of the Medal of Merit honored Taylor “for extraordinary fidelity and exceptionally meritorious conduct,” and was issued by President Truman “in accordance with the order issued by General Washington at Headquarters, Newburgh, New York, on August 7, 1782, and pursuant to Act of Congress.” From Myron C. Taylor Scrapbook No. 2, Myron C. Taylor Papers, Underhill Society of America. 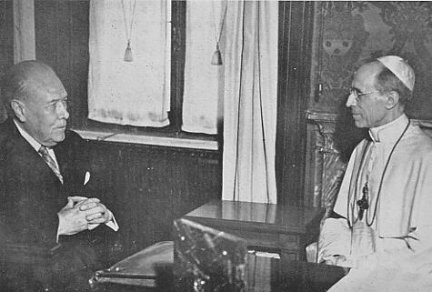 Undated photograph of Myron C. Taylor and Pope Pius XII. In 1927 Taylor and his wife, Anabel Stuart Mack Taylor, acquired the Villa Schifanoia, a Medici estate in the hamlet of San Domenico, within the old Etruscan city of Fiesole, just north of Florence, which they donated to the Pope in 1946 for the purpose of establishing a school of fine arts for American women.